I do try to limit myself to one bird blog post per day, but I couldn't help myself when this handsome little guy showed up at my feeder this morning and I was able to rattle off a few frames. A few days ago I posted about a female Rufous which was much more difficult to identify than this male that screams out why it is called "rufous". I post these three photos so you can see the gorget in three different shades of light. Pretty dang awesome!!! From my photography skills development perspective...I like the morning light that captured the eye gleam and illuminated the full length of the bill. I like the feather detail I was able to get, even the texture on top of the head running down to the bill. Can anyone tell me what shutter speed or other camera settings are best to capture the wings in freeze-frame rather than getting the wing-blur? UPDATE: A Rufous Hummer (possibly the same bird as this morning) was here this evening alternating between perching in the tree, pooping, and then coming to the feeder. I was able to get a close-up with too much leaf shadow. 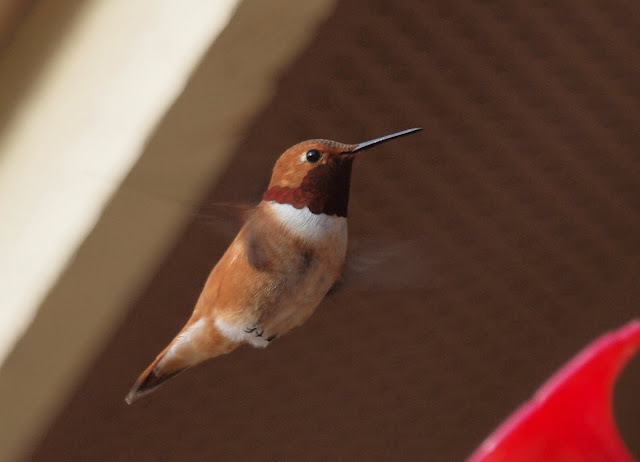 Still, the photo below shows another characteristic of the Rufous Hummingbird that I was not able to show with it in flight. Check out the green patch basically at the armpit (or wingpit). The wing itself is also mostly green in color and is well painted in The Sibley Field Guide. Thanks for the links Kathleen. That second one seems very practical for my given circumstances. Beautiful images! Thanks, since I haven't seen one in real life. Nice job. Hey, I am planning on going to Camas, Market Lake and Mud Lake on May 29 with you, if you will let me. Let me know when you will be there. I will show you some long-eared owls and we can look for some rarities. All of these folks leaving comments so far have fantastic blogs that I enjoy following. Please check them out! 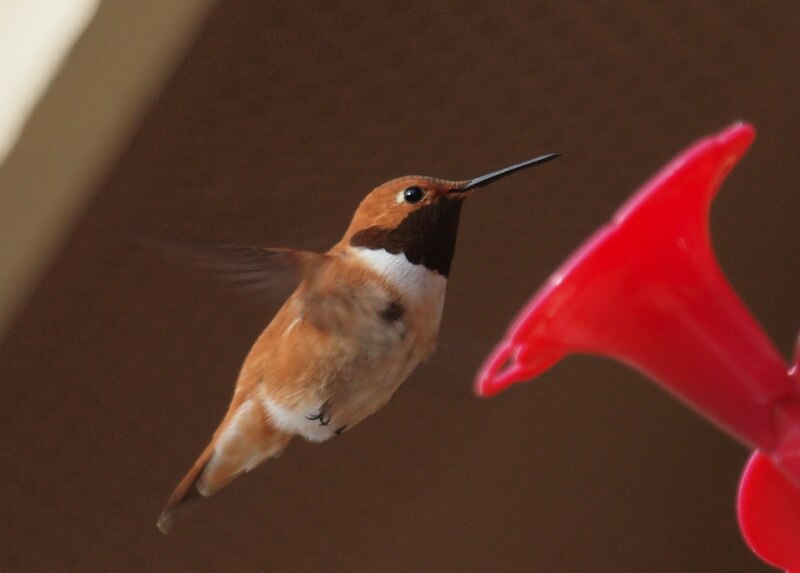 Great captures of the Rufous Hummer Robert! 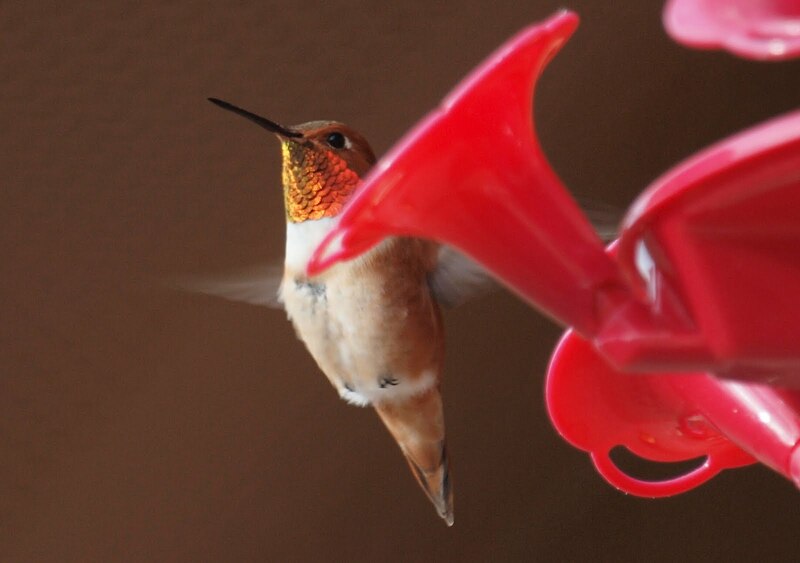 I love watching these birds as they zoom around the feeders. Too bad they are here for such a short time. 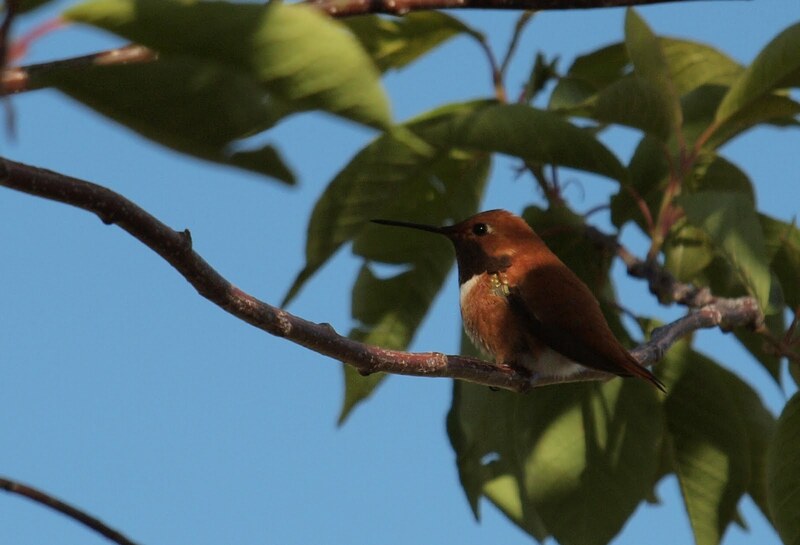 Thanks to Kathleen for the hummingbird photo tip links too. I'll have to check that out. I usually just try to get the fastest shutter speed I can to stop the wing motion. I really like your perched shot too. Super colors! Magnificent shots of a beautiful bird Robert! Well done!